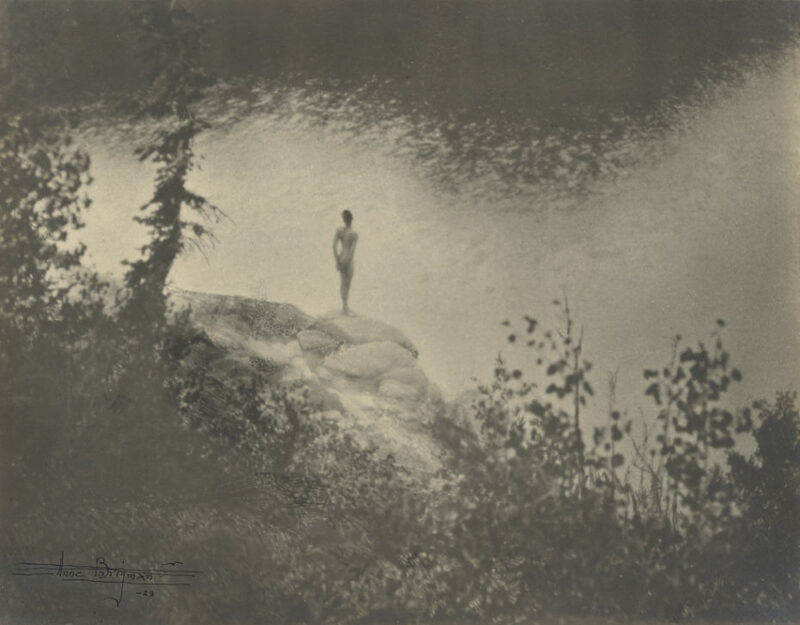 Wherever pictures are understood and admired, wherever photography in its higher aspects is discussed the work and the name of Anne Brigman come up. A Philistine, radical, virile, unafraid, she has hewn the place in art which she occupies out of granite to endure beyond her time. If she has studied, and no doubt she has, thank God none of the travail of memorized precepts and undigested laws stick out of her work. It is her art, and anything she pictures becomes her own by right of the infusion of her soul. Things live which were elsewise inanimate. Rocks and trees become vitalized with her emotions. So, too, figures become part of landscapes, not bodies put in to balance a composition or round a curve or accent a triangle but parts of the whole message, parts of the entire rolling, pulsating symphony. The smile is most apt, by chance, for she is at her best with fingers on the diapasons. With patience Mr. Edwards gives a few simple technical directions (the size of the camera, a couple of ray niters and their density, what the plate should be) discusses briefly shutters and bellows and a perfect formula for tank development, and then goes up to the mountain peaks that he knows and loves and stays there;—in this angle, lies the secret of creative work of any kind. It is because one is so filled with the vision that he cannot but portray it sooner or later. There is a painting by Leonardo da Vinci called “The Architect.” He is gray of beard and hair. He is dressed in some rich costume of the that day. Beside him on a table lies his draughting board and a large sheet of vellum and a pencil. If I recall clearly he holds in one slender hand a pair of compasses. All of this is a wonderful pattern, but it revolves around one perfect point of interest, and that is the look that da Vinci painted—dreamed ahead of his brush and his pigment, even ahead of his marvelous draughtsmanship—the look in the eye of his “Architect.” It is the look of one who sees his building in all its glory before he has put a line on the white sheet beside him. He is thinking through and beyond his medium. This leads to the memory of last summer. Late in July I made up my mind that what ailed me was hunger—hunger for the clean, high, silent places, up near the sun and the stars. So into the tried and true dunnage sack went the sleeping bag, a big coat, a change of clothes and boots, a few toilet articles and two books—Walt Whitman’s “Leaves of Grass” and “Toward Democracy” by Edward Carpenter. I looked at my 4x5 Korona View camera and the beloved Smith lens—NO! I was tired. I wanted to go and be free. I wanted the rough granite flanks of the mountains and the sweet earth. I wanted the staccato song of wind around rocks and juniper branches. The little No. 1A Ansco with its 2 ¼ film, would do. I didn’t want to work. I wanted to forget everything except that I was going back to heaven, back to heaven in my high boots, and trousers, and mackinaw coat. That was all I wanted. It was blazing hot in the Sacramento Valley, but ahead lay the foothills of the Sierras—red hills of the days of gold, red hills on which the silver-gray squaw-pines grow. When we got to them, the red dust smothered us in the flying stage—but, what of it! One, so far in human experience, must die to go to heaven. Glimpses of snowy peaks like faint cloud-banks hung in the distance above the summer heat: And then the foothills became the base of the mountains and we rose among pine and fir where clear streams rushed under drooping alders; on and on we went until the timber line began to thing and jagged peaks cut black against the cloudless evening sky. Honey-sweet of sage and buckbrush filled the air, breath of the summer sun in the woods—outposts of God’s high country. The first day in the Municipal Camp was a failure. The trouble was with me,—I didn’t care. I didn’t know the points of the compass,—and I didn’t care. I felt lost; I felt “punk”—and I didn’t care. Somewhere up the highway, up through the forest in which the camp was located, was Echo Lake, and beyond six miles (on the contour map), was Desolation Valley, the trickiest and most beloved place I know; and still I didn’t care. Malaria? No; indifference. It seemed to go clear to the bone. The second and third days were the same. Then, the balance shifted. That night I awoke suddenly,—lightning and a long echoing roar of thunder. From my tent doorway I could see huge masses of cumulus clouds behind the dark ranges across the valley, while through the somber drifts played javelins of forked light. Then I knew deep down that the “Kaumaha” (as the Hawaiians call it), the heaviness had gone. The road wound through tall woods and down a narrow way to a gentle finale becoming a part of the shore of Echo Lake. The lake itself lay flat and shimmering under the noon sunlight. I was negatively happy, but still was lost. Away up, beyond the reaches of the lake, the peaks that marked the region of Desolation Valley look insignificant and like the orthodox heaven—far, far away. So I poked along a weedy trail beside the lake until I came to a great old juniper. It was gnarled and had thunderous reiterated, lines like a fugue by Bach and it grew out of a granite wall. At the base of the tree was a boulder, slim, square and upright like an altar; on its top I built a tiny fire of juniper wood an offering to the Gods of the Mountain. It was comforting there; the lapping sound of the lake, the crackle of the fire, and an occasional whisper in the tree top. Then I started up hill, fighting through manzanita and buckbrush. The heat was intense, for I was too far below the immediate peaks to get the breeze. Up and up, over granite, wind swept trees huddled in groups or scattered like frightened sheep—strange enough to look at, but seemingly not pictorial. It was too hot to go further, so I took refuge under a low juniper, the knapsack for a pillow. Red ants came out and skated over me and bit me, and when I knocked them off they hurried back in a most undaunted fashion for new onslaught. Perhaps I dozed in spite of them for suddenly, again, came the thrilling sound of the night before—the sound of thunder! I reared to my elbow. Rising over the range to the east and banked as far as I could see each way were glorious cumulus clouds, summer thunder-clouds, full of motion and mutterings. They were coming in battalions across the sky; they were chariots of the wind; they were all argosies of the air in full sail; and the beauty of these cloud forms and their velvety shadows brought into form trees that had looked like stark nonentities, and the glaring granite took on a mysterious loveliness from their own shadows. “Do you play them a long time?” he was asked. To get those shadows, a time exposure was necessary and when I put on the K.1 ray filter I had to make exposures of such duration, that the memory of it still scares me. I simply held my breath and counted all the counts I dared. I have basic knowledge, but then my paraphernalia was so limited that I had to launch out into another dimension—a kind of swan dive—and I hit right! Desolation Valley, I wonder who gave it that name? It is primeval; it is austere; it is forbidding; it is sinister; and yet, with all it is most radiant and beautiful. It is not a place for a lawn party, or golf links—it is full of little lakes besides the great artificial one—ghostlike dead trees—and high wild peaks—wind swept and snow mantled, tower above it, but there is a lure like the lure of the desert. Strange junipers and pines have lived in its granite clefts and high spurs for thousands of years and more, while meadows of wild flowers run riot everywhere around the little lakes. I realized early in my use of the camera that the nearer the ground, in most instances, that I came with it, the better the sky line. The day I went into Desolation Valley—this primitive knowledge was a guardian angel. The tripod acted like a contortionist, all swivel joints and unlooked rust, but I put it doggedly back into the knapsack for the rest of the wonderful time. Matches somehow and interprets the whole of nature. Rare humans, rare in their minds as well as in their slim, fine bodies, have given me of their simple beauty and freedom, that I might weave them into the sagas of these wind swept trees on high peaks. I knew no one, and, as I said a while back, cared nothing. Then came the storm weather and with it, the joy of working—light on a dark mountain lake, glories of sunrise, cloud masses, and strange trees. One day on one of my wanderings I found a juniper—the most wonderful juniper that I’ve met in my eighteen years of friendship among them. It had the glorious strength, the uplift, and the wind-kissed motion of the Victory of Samothrace I sat down a short distance from it. It was a great character like the Man of Galilee or Moses the Lawgiver, or the Lord Buddha, or Abraham Lincoln—on the ground, tailor wise—the knapsack beside me—looking up to my beautiful friend. After a while I walked around the wonder tree not so tall but lovely in proportion looked at its battleship wedge-front and its broad back base. Away from the weather its bark was shining and tawny as a lion’s mane. Green-yellow moss grew along its branches and into the foliage, while the delicate gray-ivory front of the tree shone with a rippling satiny radiance of its own. Storm and stress well borned made it strong and beautiful. I climbed into it. Here was the perfect place for a figure; here the place for the right arm to rest, and even though my feet were made clumsy by boots, I could see and feel where the feet would fit perfectly into the cleft that went to its base. Once again I stood away from the tree. I might not see it again, but to know it was worthwhile. It was about 2 o’clock in the afternoon, I noticed its half lights, its few big shadows, the superb mass of its foliage and the lovely convolution of the branches. I’d clear away the debris about its base, even though I’d never see it again. There was a husky log, and old pine giant weary of life and gone long ago. 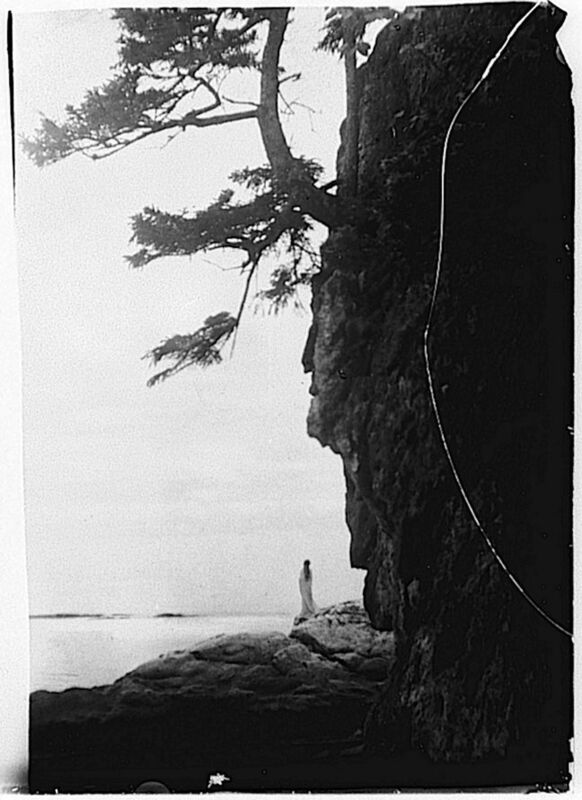 It was rolled over the cliff, and some fair sized boulders followed; there were white pebbles and sticks, little high lights that had no meaning in the scheme of things, and here and there in the tree itself small extraneous branches and cross-purpose ones. These were removed, and I told my tree adios and went back to camp through the evening light. Perhaps, because I wasn’t in sackcloth and ashes about this tree, or concerned as to what would happen in these two weeks, the Gods of the Mountain in their inscrutable ways brought to me everything, and to crown all, a lovely human. This human knew nothing of my work with mountain trees, but was willing to go to the wonder-tree and there, in this high, lone place, with the lame duck camera, between hail showers from racing clouds and glorious sunlight, the film of the print INVICTUS came to birth. 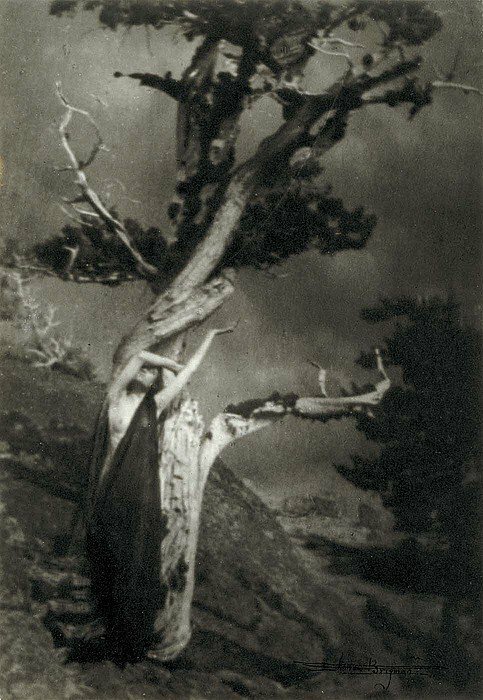 Note: All of Anne Brigman’s films of this particular summer had to be intensified. Her films are always carried into the positive (transparency form), process films being used, and from this into the enlarged negative.